My powerful Vision Board workshops has been a big way for women to start the new year for the last 2 years. Join me in January to launch your 2019 with clarity and intention! I will guide and coach you to bring a clear focus to your biggest dreams and bring your vision to life, in the company of an intimate group. You will get intentional and clear about what you really want to create in your life. We will go deep, as I guide you to connecting to the desires you hold for the life you want — personally and/or related to your work. You'll focus on what you want to be, what you want to do, what you want to have in your life in the next months and beyond. This is a day for breathing room, focus, reflection and big dreaming — a real gift to yourself as you contemplate the life you truly want to create. After doing guided exercises that will lead you to finding clarity, I will teach you how to make your Vision Board. You'll have plenty of time to do this amazing project. At the end of our day together you will have your unique, personal Vision Board to take home, so that you can reflect on and connect to your big dreams in the months ahead. And, I am adding something exciting and new for this workshop! 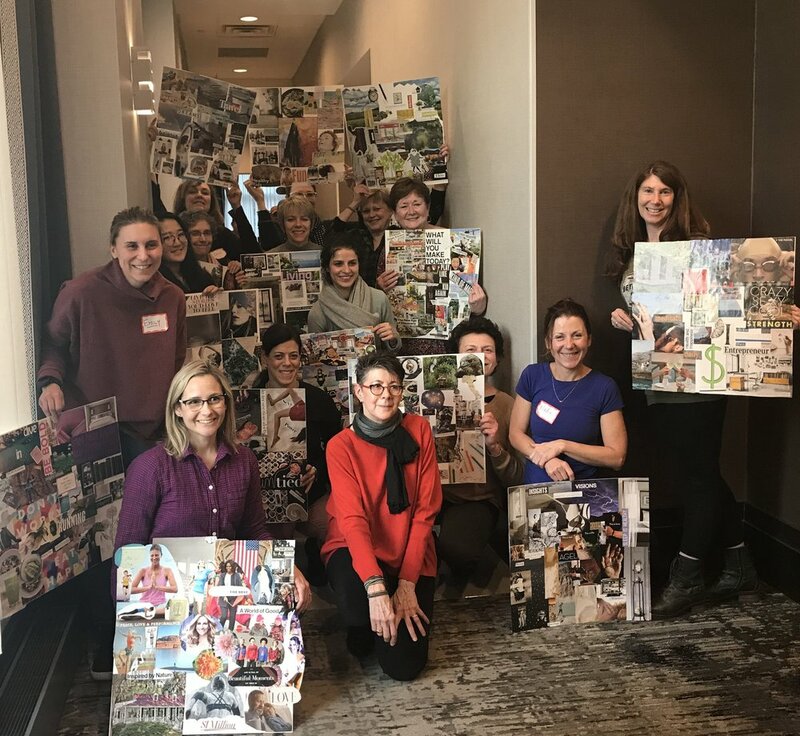 Feedback has shown that women have loved the experience of creating their vision boards, as well as the closeness developed with the other participants, and they want more connection and support. In response, I have planned for the immersion in our work to continue! We will share an early dinner together at a nearby restaurant and then return to my Brookline studio for dessert and an evening session of reflection, sharing, and support. Each woman will be guided to choose specific commitments to make to herself and to create a process for staying committed and accountable. Following this workshop, you'll experience delight as manifestation begins to work in your life. How does that happen? When you get clear and your intentions are focused, and you bring commitment to what you want, you let go of what's in the way and you begin to attract the outcomes you desire. This is your opportunity to dream big and live your life with more clarity, focus and intention than ever. Space is limited to 15 participants for this workshop. Dinner is not included in the workshop fee. Ample free parking and close to a Green Line T stop. The address will be sent upon registration.